bebop spoken here: Jazz Café Jam Session - May 1. 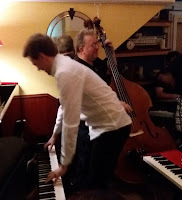 With James Harrison on keyboards, I knew this would be no ordinary jam and it wasn't! Young 'Jack-in-a-Box' is guaranteed to enliven any gathering - sometimes to excess - and this was no exception. Bourbon St. Parade was an unlikely opener with James ripping through the traditional New Orleans flag-waver like as though he was in a bar off Congo Square. Russ Morgan kept up the Red Beans and Rice flavour with some parade drumming whilst a bemused Paul Grainger played all the right notes in all the right places. In a Mellow Tone and the seemingly obligatory bossa nova (Summer Samba aka So Nice) followed before it was time to start the jam session proper! First up was Kate O'Neill with God Bless the Child and Alfie. The latter tune owed nothing to Cilla Black and had some impish piano from James. Ray Johnson played bebop on, I think, Moments Notice (I'm guessing!) and Polka Dots and Moonbeams (not guessing). Dan Garel blew some dazzling alto on Stella by Starlight and another tune I vaguely recognised. A newcomer on drums - Michael Young - slotted in well. Get James Harrison and, nine times out of ten, you get Paul Skerritt. Tonight, the South Shields' Sinatra sang It's Only a Paper Moon and Don't Get Around Much Anymore. With Dan Garel on alto, it went down well. Another singing sensation took to the ‘stage’ - Nifemi Osiyemi. I Just Want to Make Love to You (the line was already forming) and it was one soulful rendition - this girl don't take no prisoners! Wow! Makin' Whoopee followed by which time Paul Gowland was blowing soprano. Paul stayed in the spotlight for My Favourite Things and My Foolish Heart with Hazem 'Mo' Mohammed now on drums. Change of pianist. Ben Richardson, a regular 'jammer', played a sensitive version of I Can't Get Started. John Pope, fresh from a visit to the barbershop, took over from Paul Grainger on bass with the frontline now Garel and David 'Showtime' Gray and yet another drummer, Harry Still. Don't ask me what they played but it was a rouser that brought the house down. They were going through drummers tonight like Sunderland go through managers and John Bradford was the next one to bite the bullet as they introduced one another to Miss Jones. We've met the lady a few times but she keeps coming back for more and I'm sure she enjoyed this romp as much as we did. Paul Skerritt returned for the finale. Not just Paul, but just about everyone still standing, including the hip-swivelling Osiyemi. They were Letting the Good Times Roll. James Harrison (keys); Paul Grainger (bass); Russ Morgan (drums) + Kate O'Neill (vocals); Ray Johnson (trumpet); Dan Garel (alto); Michael Young (drums); Paul Skerritt (vocal); Nifemi Osiyemi (vocals); Paul Gowland (soprano); Hazem 'Mo' Mohammed (drums); Ben Richardson (piano); Harry Still (drums); John Pope (bass); John Bradford (drums); David 'Showtime' Gray (trombone). PS: For the final number James switched from electric piano to steam piano as this photo by Russell shows. Yes it was Moment's Notice Lance.